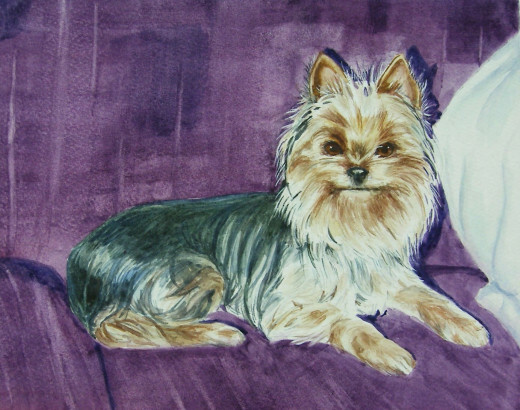 As a watercolor artist and dog lover, a natural subject for my work is portraits of dogs. 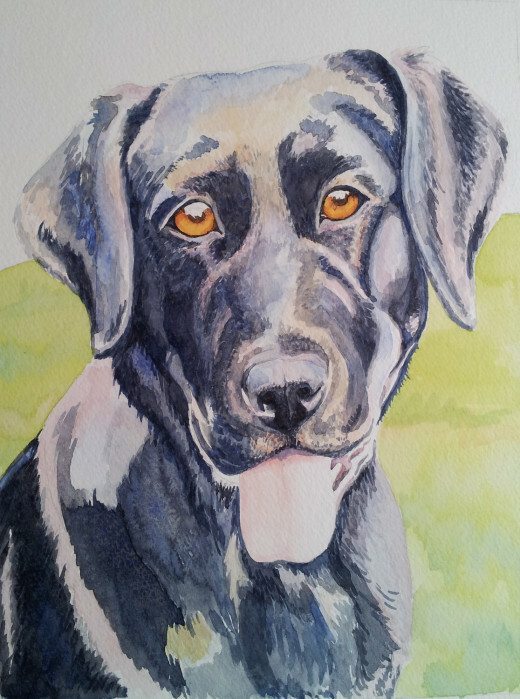 I have created many portraits of people's canine companions over the years and have enjoyed creating every one of them. I have done these portraits on a commission basis for friends and family and for people who have learned about my work in a variety of ways. Dogs are a charming subject for a portrait with their engaging expressions and guileless demeanor. 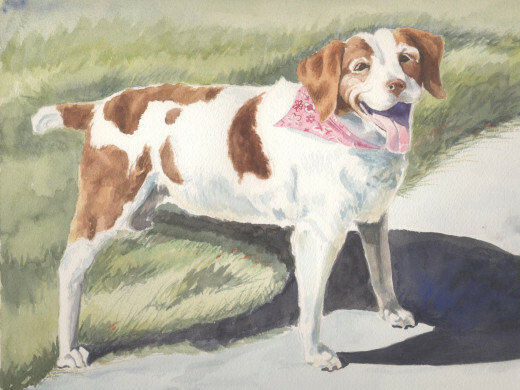 In this article I will relate some of my experience as a dog portraitist in the hope that as an artist, you will be encouraged to give this genre a try. 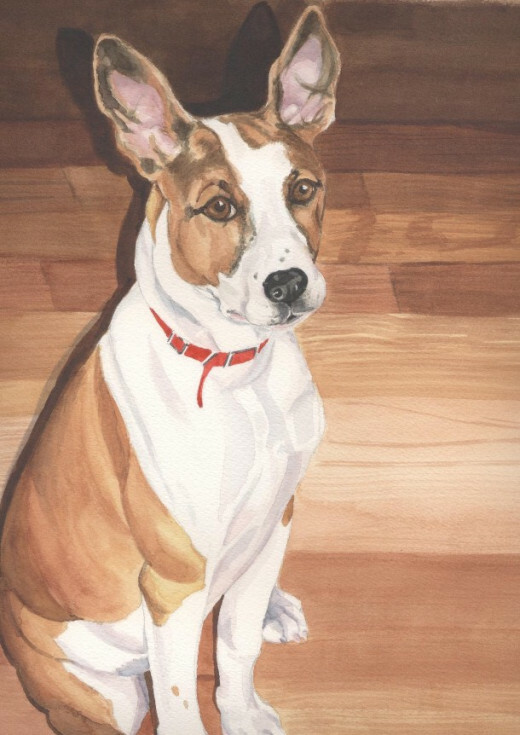 If you are a lover of a particular dog but not an artist yourself, I hope this hub will help you find an artist who can sensitively portray your four-legged friend. Interspersed within the article I will present some of the watercolor portraits I have done for my clients. Each of these paintings was a joy to do and represents a wonderful dog who has been an important part of someone's life. The biggest key to the successful portrait of a dog (or any other subject) is the artist's familiarity with the particular subject at hand. To this end, it is helpful for the portrait artist to spend time with the subject (if possible) to watch for characteristic poses and expressions. It is also important for an artist who wishes to concentrate on dogs as subject matter to study dog behavior. Artists interested in creating dog portraiture should study dog anatomy in general terms to help them realistically render dogs of all types in addition to one particular dog. Unlike humans who all conform (more or less) with certain proportions in the arrangement of their facial features and physiques (see my hubs dealing with the "roadmap" to proportional faces), dogs come in a myriad of shapes and sizes so that each one is distinctive. It is worthwhile for the artist to familiarize themselves with the many breeds of dogs to see how they vary in size, shape, type of fur, coloring, etc. 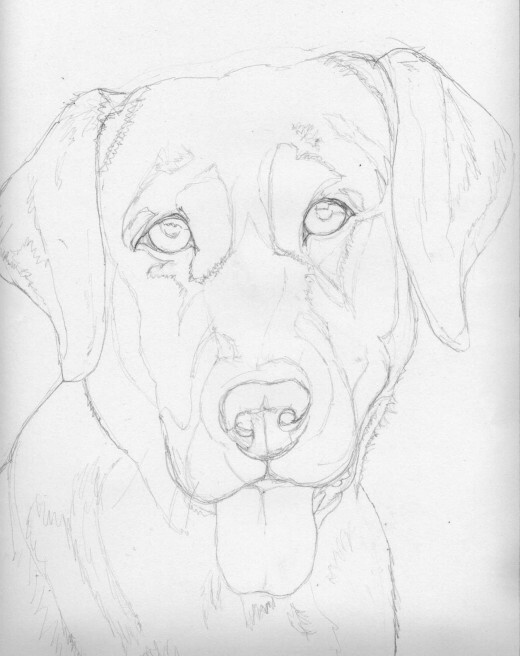 This information can then be used to help the artist get a likeness of even a greatly "mixed" dog. 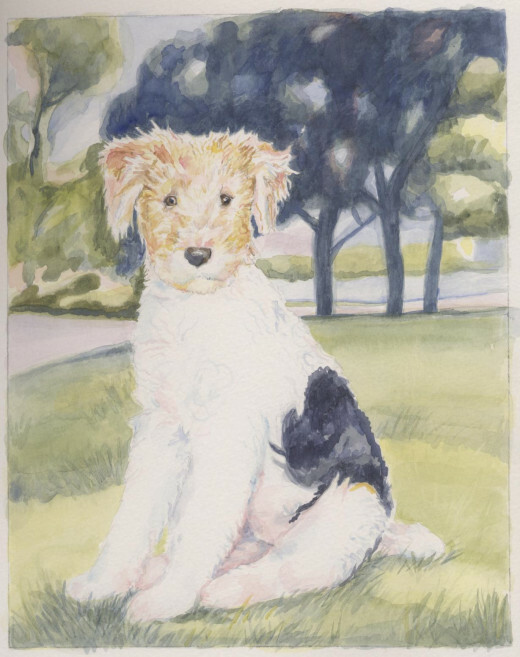 Dixie, watercolor, 8 x 10"
From my experience as a painter who does portraits of animals, I can say it is almost certain that anyone endeavoring to create a likeness of a particular dog (or cat, or horse, etc.) will need to use photographic references. If your subject is a particularly zen-like creature, the artist may be able to do some preliminary sketches from life. If they are possible, these sketches can be very valuable in discovering characteristic poses the animal strikes. However, the reality is that most animals (particularly young ones) are quite animated and rarely hold still long enough to allow for any kind of detailed drawing. The photographic references you have at your disposal are vital to the quality of the final portrait. These photos can be provided to you by the person commissioning the portrait, or you can take photos of the subject yourself. Wherever these photos come from, they must be of good quality. It is hugely frustrating to try to make an engaging portrait while relying on dark, fuzzy, and confusing photos. As a dog portraitist, you may be called on to do a posthumous painting of a subject. Then, of course you will have to rely on photos taken by someone else to create the portrait. In this case, I would suggest that unless there are good quality photos of the dog, you would be best served turning down the commission with regrets. 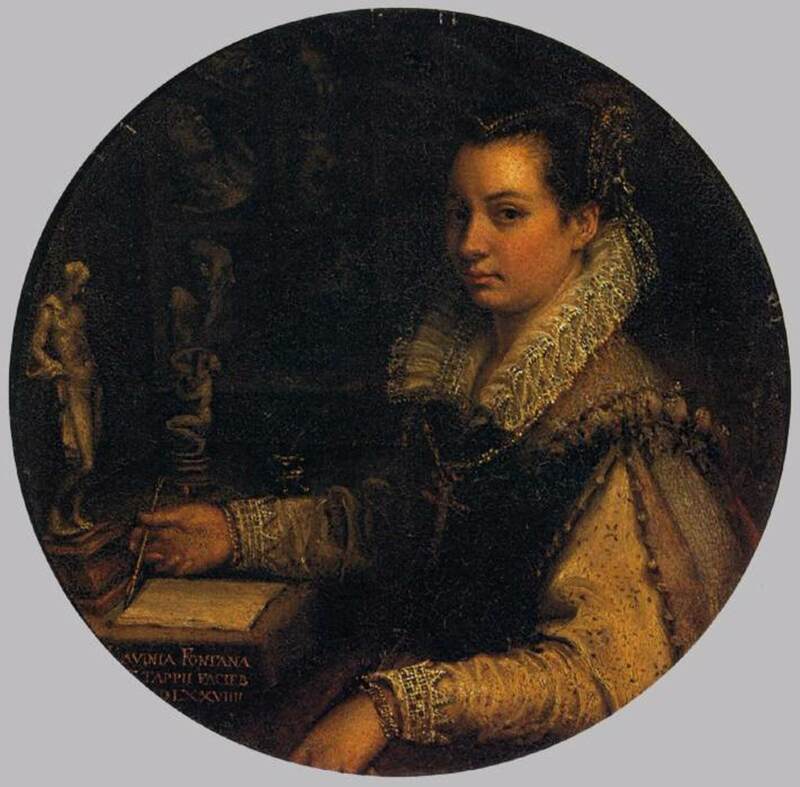 It is better to save yourself the frustration and spare your patron the disappointment of a poor quality portrait. If the dog was a pure breed, you may be able to infer enough information based on the breed standards to do a serviceable job of the portrait. 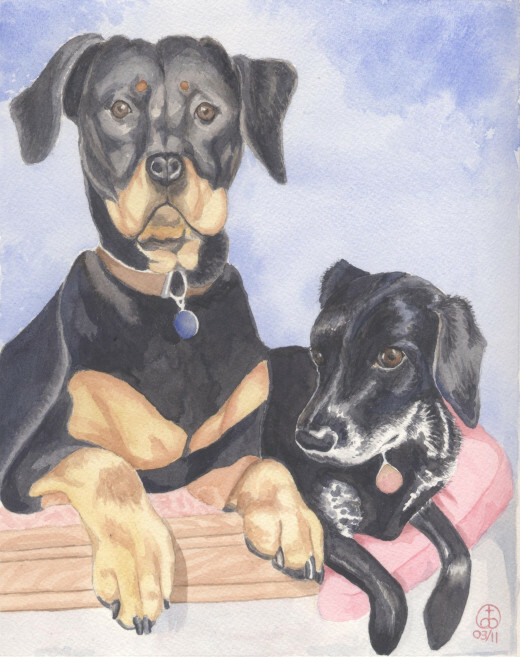 Tyler's Doggies, watercolor 10 x 8"
It is not my intent to give specific information on "how" to paint a portrait of a dog. These particulars are up to the artist and his or her style and approach to painting. However, I can give a few bits of advice that may be helpful in creating a pleasing image that will stand up as a work of art as well as a meaningful portrait of a beloved companion. In my portraits of dogs, I like to keep the background very simple. 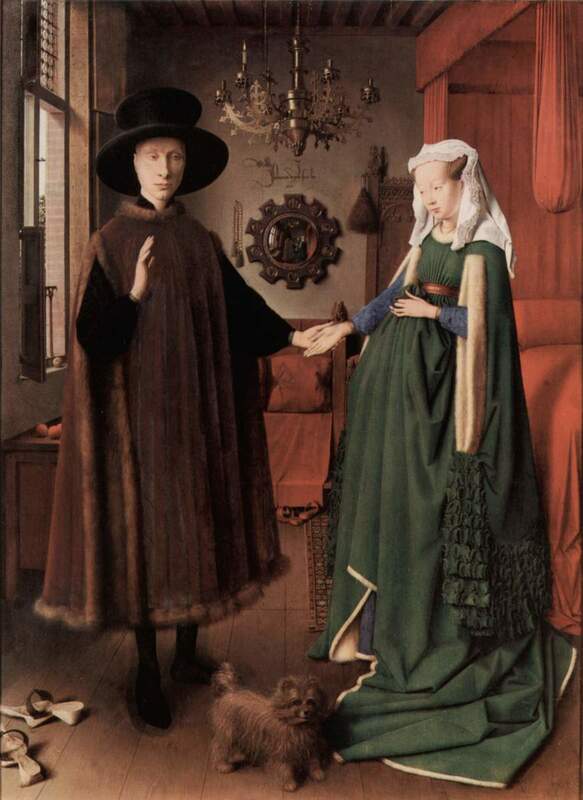 The main focus of the painting should be on the dog, not on elaborate or involved background treatments. While I like to keep the background simple, I also like to employ a little vibrant color. Dogs tend to be somewhat muted in their coloring, so it's nice to add just a touch of a bright color somewhere in the painting. Just a word about black dogs. Many artists shy away from painting black dogs and black animals in general. I would advise that with good reference photos, it is quite possible to paint vibrant, colorful portraits of animals with black coats. To do so, the artist must be sensitive to the colors that are reflected and suggested by the light that falls on the subject. In the painting in progress of Molly to the right, you can see that several colors are influencing the appearance of her black fur. As the painting progresses some of this vibrancy will be toned down, but not completely eliminated. These colors will lend interest and dimension to what too often is portrayed as a flat black shape. The most important aspect of a dog from their owner's perspective is the relationship they have with each other. Therefore, I find it best to have the dog appear to be looking at the viewer - indicative of the relationship between the dog and its people. It is also important to give the dog's eye a spark of light. 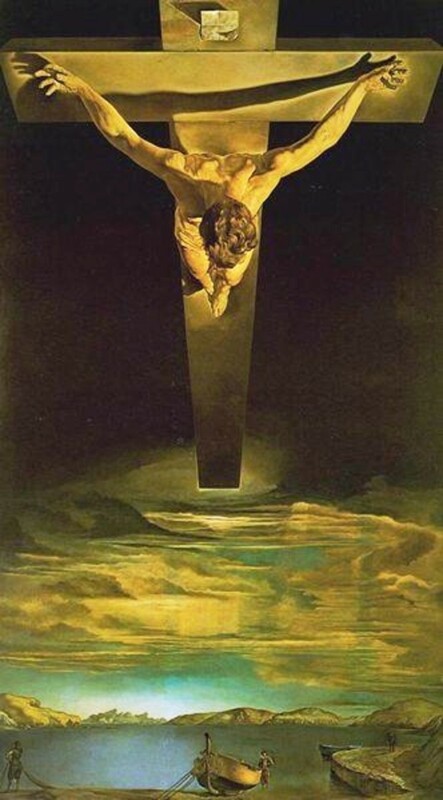 This helps the portrait have a sense of light and life. CD, watercolor 8 x 10"
Gwyn, watercolor 10 x 8"
Dogs are beautiful creatures, full of charm and a boundless capacity for love and companionship. These qualities make them excellent subjects for portraiture. It is very rewarding to capture the likeness and spirit of these wonderful animals. Whether you are an artist who is interested in creating dog portraits, or you are a person hoping to commission a portrait of your best friend, I hope this article has encouraged you to investigate the world of dog portraits for yourself. If you are seeking a portraitist to paint your dog, always check the artist's previous work to ensure that they create quality work that respects the beauty and dignity of their subjects. 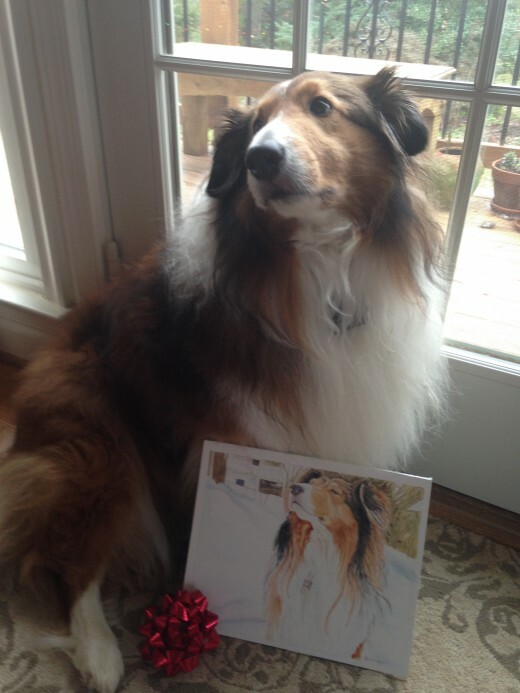 If you are an artist hoping to obtain commissions for dog portraits, make sure your work is of the utmost quality. 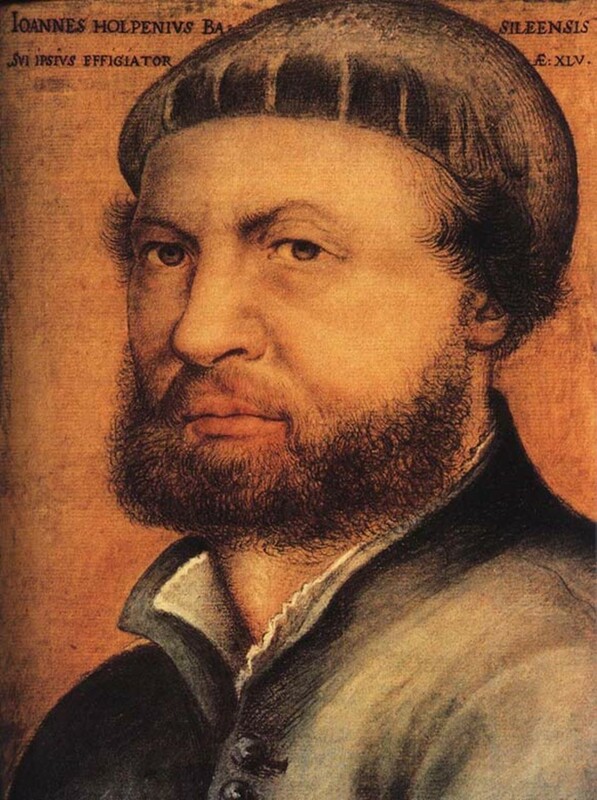 Painting portraits of any kind requires a special sensitivity and accuracy that other genres do not always demand. It is an honor to be entrusted with creating such an important image - always do your best to earn that trust! Actually, Shep seems to be wondering why he's being asked to sit still on Christmas morning. 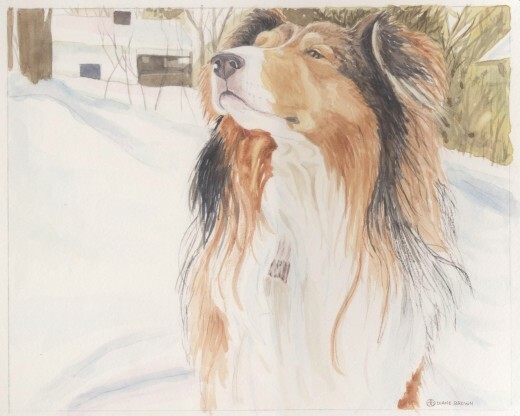 Shep in the Snow, Watercolor 8x10"
Thanks for reading, Larry Rankin! I'm glad you enjoyed my article. I love dogs, too. I find them to be one of my favorite subjects for painting. I applaud you for using your artwork in your hubs. It's a rare person (of the adult stripe) who is willing to share their art with others. Drawing is a skill (like most others) that can be gained and improved with good teaching and lots of practice. I love all dogs from mutt to pure breed. My dog for the last 11 years has been a Jack Russell terrier named Honey. Just an amazing animal. 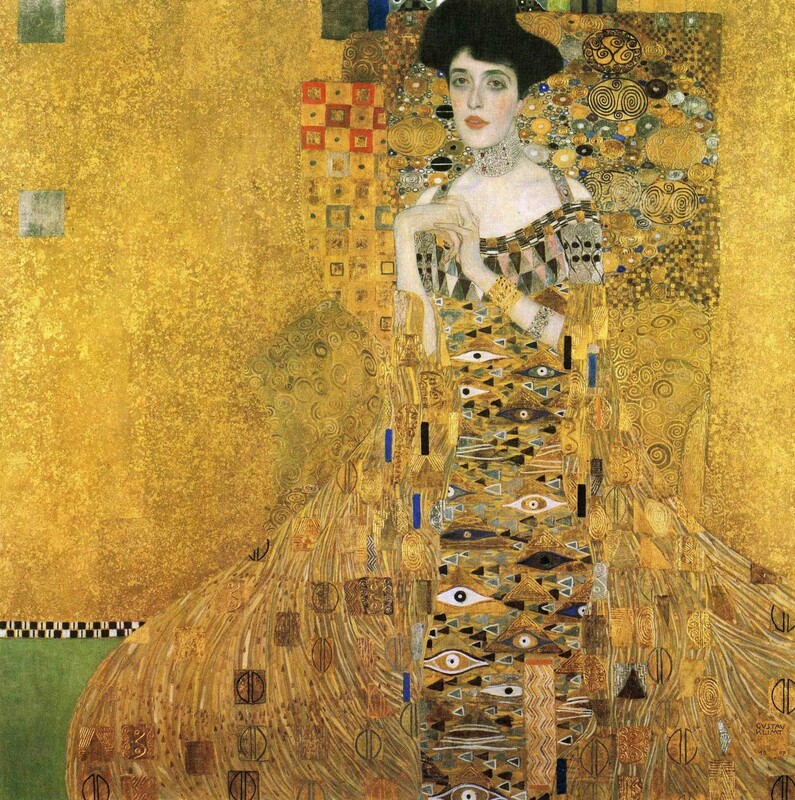 I am enjoying learning about art from you. What I know about the subject wouldn't fill a thimble, but I do enjoy drawing, and find myself forced to subject people to my artwork on my hubs through the necessity of not being able to find photos. Thanks, Delia-Delia! I'm glad you enjoyed it. I enjoyed your watercolors of dogs...I use acrylics to paint, but do use watercolors occasionally...for me the W/C medium is challenging...Thanks for sharing! Thanks so much, Better Yourself! I love dogs too! 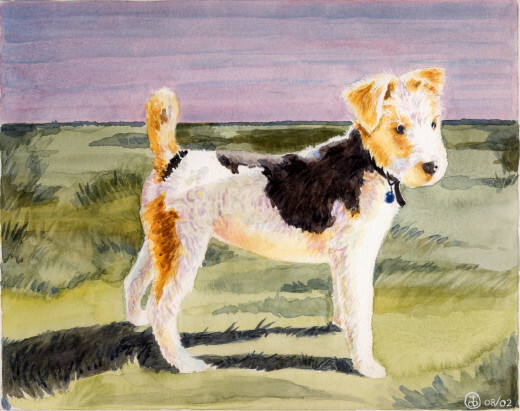 I think that watercolor is a great medium to capture the wonderful, light spirit of our canine friends. I appreciate your comment, and am glad you enjoyed this article. I'm in awe of the watercolor pieces you includes above. I have had a hard time mastering watercolor painting, but enjoy oil and acrylic. Beautiful pups, and I can truly appreciate the love of making art for people with pets. We have 4 dogs and love them so dearly! Great hub, Thanks for sharing!! I'll definitely share anything I know! Excellent! I'll look forward to that hub. I can use all the advice I can get! I definitely will. I wrote one hub on selecting a camera and I will post another - sort of the novice's guide to photography...but I want to make sure I know all of the facts first. I'll post some pics too. You will have to write a hub about your photography, epbooks! I would love to see examples of your photos and to hear what inspired you to take certain shots. I really enjoy hearing from other artists about what motivates and inspires them. Oh, you are probably not as bad as you think. And honestly, I'm still a novice photographer! I just started dabbling in it and over the past two months have read trade magazines, practiced and I still have a ways to go, but the more I understand about it, the better I get. So true about dramatic lighting!I took a test shot of a simple little figurine in dramatic lighting and I have to say, it looked amazing!! Isn't it funny? I am about the world's worst photographer! I do take reference photos for my paintings, but it takes me HUNDREDS of photos to get the image I'm looking for. I am getting better, but it's still a major headache for me. You're right, the concepts that make a painting or drawing "work" are exactly the same as with photography. To me, capturing the light as it hits the subject is so important. Dramatic lighting can really "make" a painting or a photo. I'm enjoying your hubs thoroughly. While I can't draw, I do love photography and I'm finding a lot of your advice (focal points, etc) applies to photography as well! Thanks, epbooks! I will look you up on facebook. Golden Retrievers are such gorgeous dogs! I'd truly love to do a portrait of one. I hope you enjoy my hubs. I write almost exclusively about art (go with what you know), but I hope there will be something there that strikes your fancy. Thanks again for you time and interest! Hi Dbro! I'm planning on reading your hubs tonight! :) I'm sure I'll love them. I'll post more photos here and if you are on facebook, please join me there as well, there's tons of photos there. My page is www.facebook.com/goldenbooks1 Onto your hubs now! I'd really like to see some of your photos, epbooks. I'm always on the look-out for good reference photos. I'm looking forward to reading more of your hubs. I appreciate good writing, and you have a real talent for expressing yourself in a way that is so genuine and straightforward. I hope you'll read more from me and let me know what you think. It was my pleasure to read! And if you do paint a golden (or need a pic to paint) please let me know! :) And so glad that I met you too!! Angela - Thank you for your kind comments! I hope to see you soon as well. epbooks - I appreciate you reading the article. I do love dogs. I'd love to paint a golden retriever sometime ;) I look forward to reading more of your articles. I feel like I've found a new friend! Wow you are very talented! 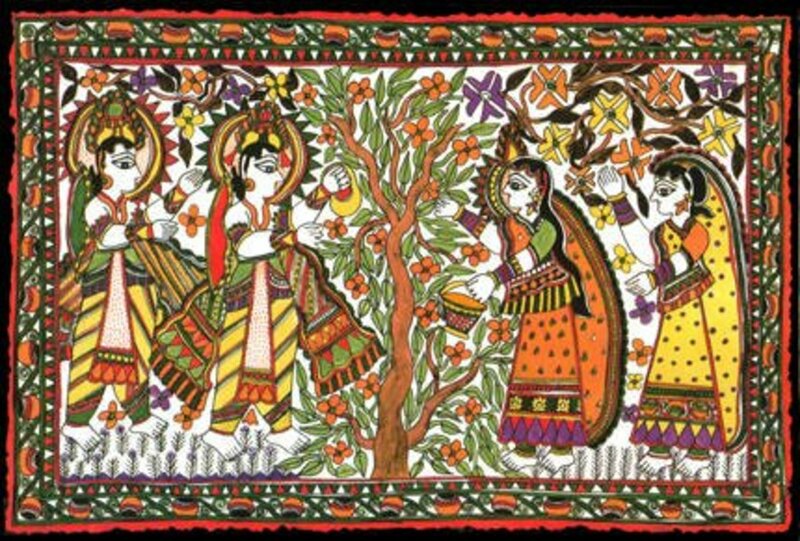 Not only do you write well but you paint beautifully! I love that you are a dog lover (me too)! I have no skill with a paint brush whatsoever, but I love viewing other people's work. Thank you for sharing your pics. Great job! I enjoyed your article very much, and of course I loved the pictures. The dogs' personalities were captured as well as their beauty. That's some feat! Hope you are having a good summer, and I'm hoping to see you before long.